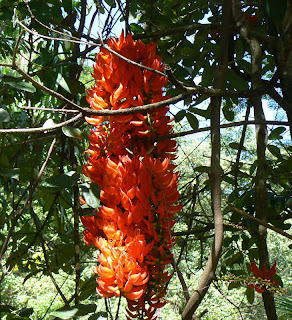 This is the time of year when the beautiful Flame of the Forest vine bursts into flower. The forest canopy behind our house is slowly coming alive with these incredible waxy bracts. The vigorous vine grows in great loops between the trees but unfortunately the flowers only last a few days before they start to decline. The vine only seems to produce seeds very occasionally and they are very slow to germinate. The photo shows another vine on the other side of the house which I started from one of the seeds about 10 years ago and it took about 5-6 years before flowering. Now look at it! These are actually a number of bracts which just happen to have opened alongside each other - to the bottm right you can see another bract just starting to open - the vine it's attached to is the thick stem just to the right of the big bunch. This frog's no mug ... !